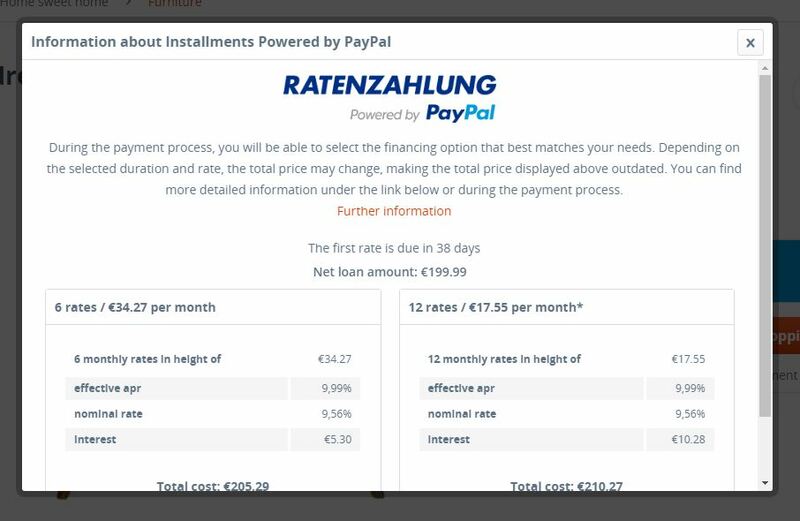 The plugin "Installments powered by PayPal" provides you the opportunity to offer the settlement of larger orders in installments to your customers. The product "Installments powered by PayPal" has to be activated for every retailer individually. Visit PayPal for further information and to request this activation. Please note that installments can only be provided to customers in Germany. You can find and install the plugin via the plugin manager. After that installation, you can configure it directly. API-Username (1): Here you enter the API username you received from PayPal. API-Password (2): In this option, you enter the API-password also received from PayPal. 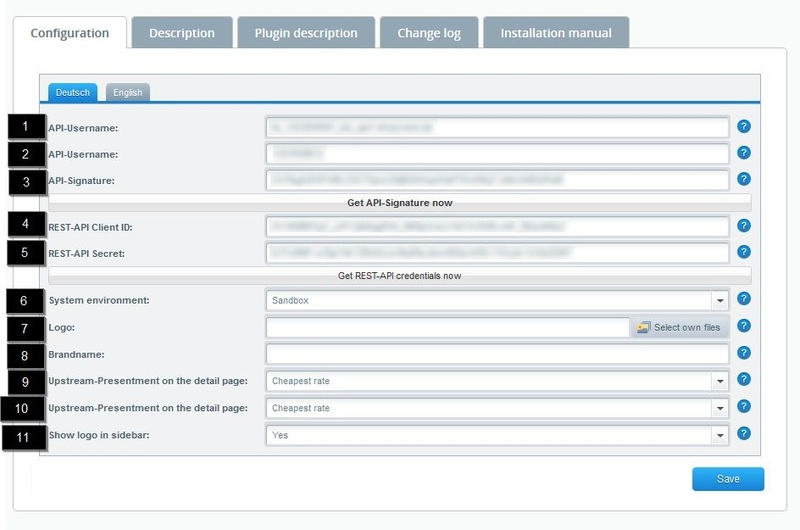 API-Signature (3): Here you set the API-Signature, which you also received from PayPal. REST-API Client ID (4): Enter PayPals REST-API Client ID here. REST-API Secret (5): Fill in your REST-API Secret here. System environment (6): Similar to the other PayPal Plugins, you can activate the sandbox mode using the separate api credentials. In this mode, you have test customers, with them you can perform orders to test the interface. This sandbox mode is unsuitable for the live mode, so please switch the system environment again when you want to use the plugin in live mode again. Logo (7): Via this setting you have the opportunity to choose a logo which will be displayed on the sides refering to the installments. Your picture should have the size of 750x90 pixels. Brandname (8): Here you can define a brand name, which can also be found on the sides refering to the installments. Upstream-Presentment on the detail pagee (9): With this setting, you can influence the presentation of the upstream-presentment on the detail page. You can choose betwen three options. Further information about upstream-presentment can be found in the corresponding paragraph Upstream-Presentment. Upstream-Presentment on the checkout page (10): Here you're able to change the presentation of the upstream-presentment on the checkout page. Further information on this topic can be found in the corresponding paragraph Upstream-Presentment as well. Show logo on sidebar(11): Via this setting you can decide, if a logo about installments should be displayed under your sidebar. To be completely compatible to subshops or language shops, you can set up the plugin configuration for each shop individually. Furthermore, the setting of the field "Show logo on sidebar" can be inherited from the main shop. Via the corresponding tabs you're able to navigate to the setting of the several shops and to make the desired changes in the settings. Your customers are able to use installments as a payment method. As soon as a customer chooses to take installments as his payment method, the following area will be added in the checkout. With a click on "Apply for credit", the financing will be handled step by step and the order can be finished that way. 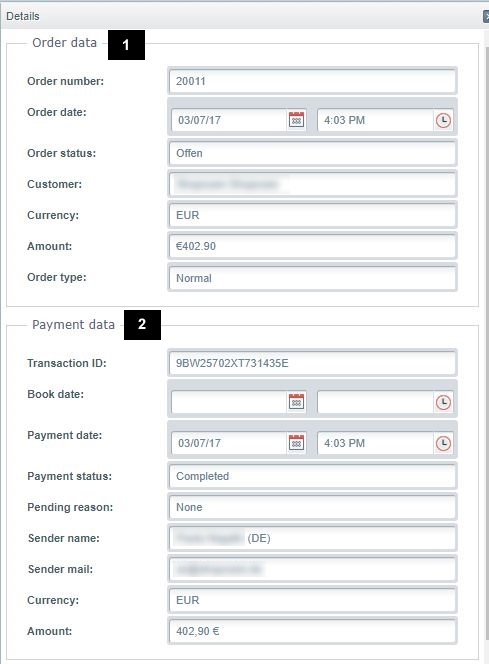 In the backend you have the possibility to see the orders of your customers in Customers > Payments > Installment payment Powered by PayPal. There you will find information about the order data (1), the payment data (2), seller protection address (3) as well as a general overview of the transaction (4). Order number: Here you can find the order number of the order. Order date: Here you can see the date of the order. Order status: This is the order status, which you can change as usual in the module Orders. Customer: Here you will see the customers first name and surname. Currency: Here you can find the currency which is used. Amount: This is the total oder amount. This is composed of the article price, VAT and interest. Order type: With this field you will always get the value "normal", since there is no different payment possibilities with installment payment. Transaction ID: Here you can find the transaction code specified by PayPal. Book date: The booking date shows you when the order has been received at PayPal. Payment date: This is the date on which PayPal agreed to the payment by installments. Payment status: This payment status is automatically transmitted by PayPal. Pending reason: If there is a delay in the payment, you will find the reason here. Sender name: Here you will find the first name and surname of the sender. 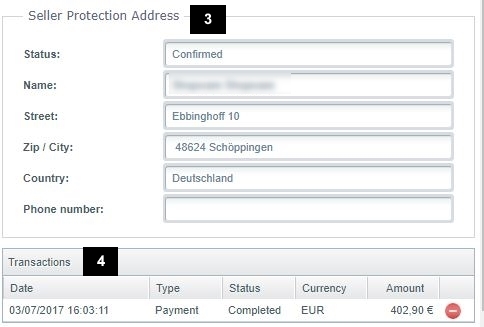 These fields are entered by the customer in the installment request on the PayPal page. Sender mail: In this field you will find the email address, which is given when you enter the data on the PayPal installment page. Amount: In this field you will find the total amount that the customer has to pay in total. Status: Here you will find the status of the buyer's data which are confirmed by PayPal. Name: Here you will see the customers first name and surname. Street: In addition to the name, you can see the street and house number here. Zip / City: In order for the address to be complete, you can see here the postal code and the city. Country: This is the country where the customer's address is located. Phone number: This field gets the phone number from the customer account. If the phone number is not a required field in your shop, this field can also be empty. Transactions: Here you have a small overview of the most important data of the transaction of PayPal. This module lists only approved installment applications. Rejected applications are not listed here. PayPal Installments is not eligible for your customers in their account, PayPal Installments is only offered in the checkout and only, if the requirements are fullfilled. Also PayPal Installments will never become the user's default payment method like other payment methods. The order contains physical goods. Immaterial goods are excluded. In the case, that e.g. the price of an article doesn't fullfill the requirements (yet), a hint will be displayed. 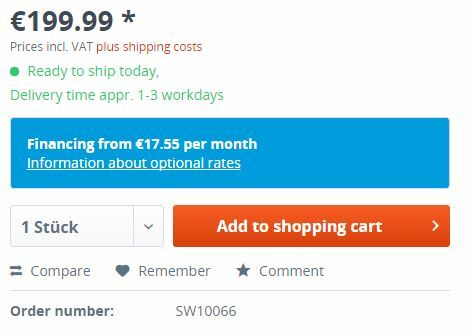 As mentioned in the paragraph Configuration, the payment method can be advertised via upstream-presentment in your shop. Next to the opportunity to go without the upstream presentment via choosing "None", you're able to choose between "Simple" and "Cheapest rate". 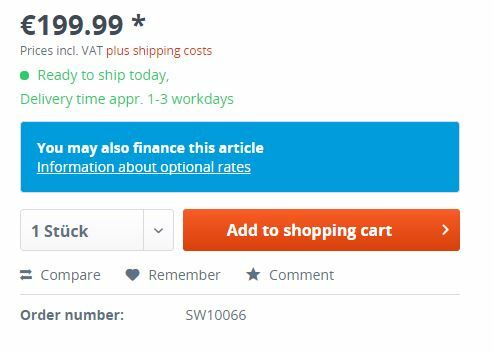 If you decide to use the option "Simple", a small hint will be displayed on your detail and/or checkout pages, depending on your desired setting. This hint will call attention to the installments. 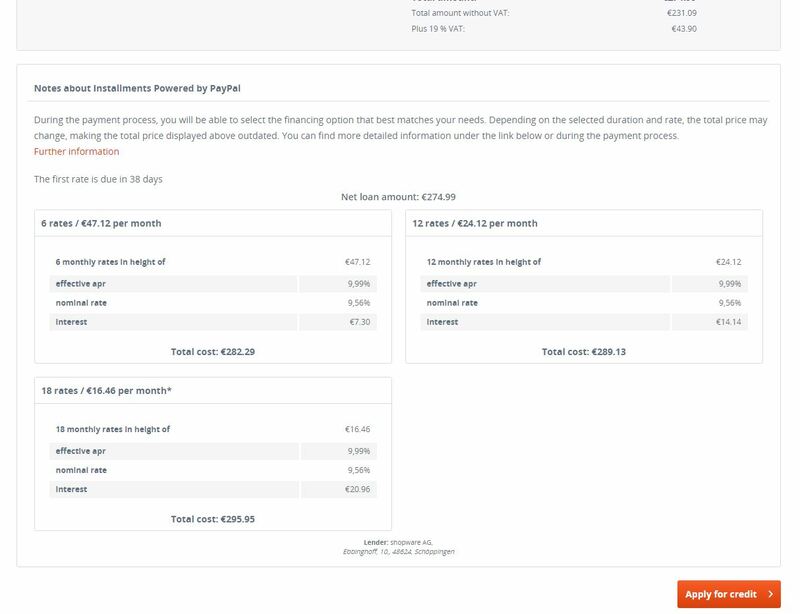 By choosing the option "Cheapest rate", a representative example on an installments financing will be displayed directly. Using this, the cheapest rate will be used so that the customer can get an idea of a possible financing. 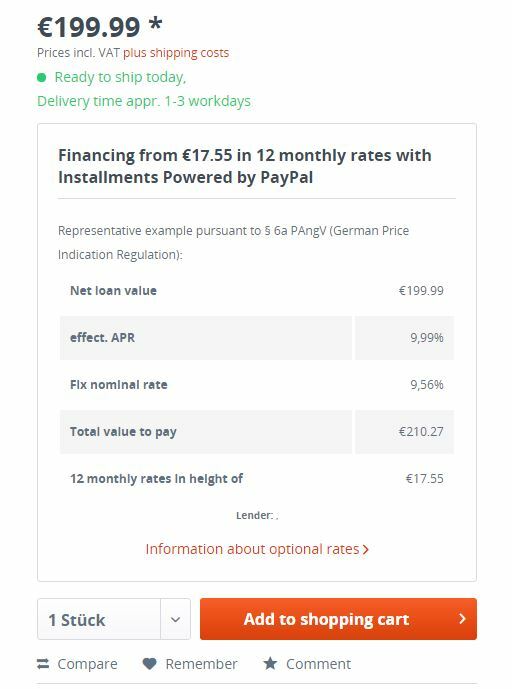 While using both options, the customer can get access to further information and additional examples via clicking "Information about optional rates". The declaration about the lender will be referred from the fields "Company" and "Address" of your basic settings, which can be changed in Configuration > Basic settings > Shop settings > Basic information. Please pay attention to this data, so that the lender will be displayed correctly.